Looking to get your feet off the ground? There is nothing like taking in an incredible view and experiencing something from a height. Choose from our exciting range of high activities and we guarantee you will get the adrenaline pumping. 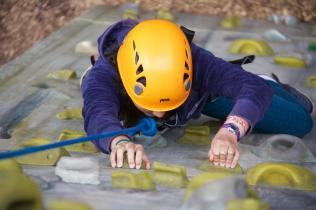 Climb or Abseil down our 10 metre climbing tower and push yourself to your limits whilst taking in incredible views. The climbing tower has 6 structured routes plus an overhang, so you can really challenge yourself. 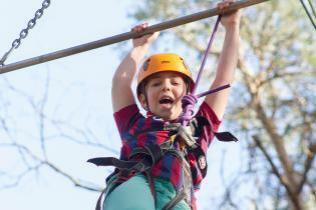 Get up high in the trees with our exciting and challenging High Ropes course. There are various tree based elements sitting 9 metres above the ground, each waiting for you to take them on, alone or as a team. Experience Tree Climbing and discover nature in a different way as you learn skills to ascend the ropes and work your way high up into the trees. It’s a great challenge and hanging around up there is so much fun. Get the adrenaline pumping as you travel at high speeds over our stunning lake on our zip wire. With incredible scenery to enjoy, this exhilarating experience is one not to miss! It's almost like you're flying.